The Tema-based music group, R2Bees last night at 14 Edition of the Vodafone Ghana Music Awards held at the Accra International Conference Center. The group won six (6) Awards including the infamous category, Artist of the Year. The other award categories which they also took home were Group of the Year, Hiplife/Hip-Hop Artist of the Year, Hiplife Song of the Year, Highlife Song of the Year and Vodafone Song of the Year Award. 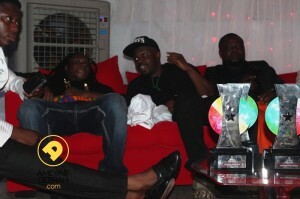 There were other artists who also grabbed multiple awards; Kaakie with Best Reggae/Dancehall Song of the Year as well as Best New Artist, M.anifest with Hip-Hop Song of the Year as well as Best Rapper of the Year and Herty Borngreat with Gospel Artist of the Year as well as Best Collaoration of the Year Award which she shared with Trigmatic for Kano Seyaa. The African Artist of the Year Award was won by Nigeria superstar, Wizkid. The 14th Edition of the Vodafone Ghana Music Awards saw great performances this Saturday from the likes of Herty Borngreat, Kwaw Kese, Criss Waddle, VIP, Sarkodie,Fuse ODG, Banky W, Wizkid, M.anifest, ASEM, R2Bees, Amanzeba, not forgetting Kontihene and Akatakyie who took us back in time to enjoy vintage hit songs from way back in the days. Find below a full list of all the winners from the 14th VGMAs.